Currys PC World. This excludes the Channel Islands and BFPO. Box contents: Huawei Watch 2, Charging cradle, Power adapter, Quick start guide. 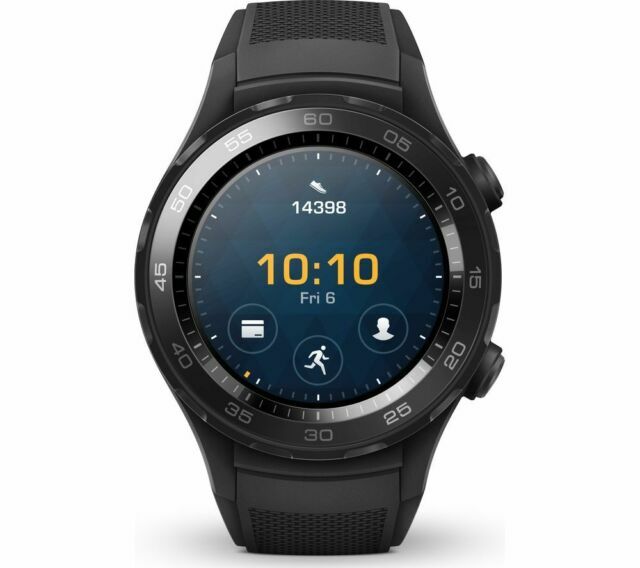 Along with step count and calorie burn, theWatch 2 has a built-in heart rate monitor to help you check your overall health and fitness progress. Great watch, loads of features. From multiple watch faces for choice. Bluetooth, & Wifi built in, as you'd expect. Voice to text works flawlessly, even with my pigeon Geordie English. You can load apps such as google maps etc. Works great. No issues. want to make calls? No problem, built in speaker & mic. Flawless! Fitness, you name it, it's already there. Sleep tracker, to steps, heart rate. Superb..... if you like that kind of thing.. What would improve it? I'd like to go swimming in it. Though they say its ok for showers and wotnot, I wouldn't like. Overall, I love the watch. But I do like my gadgets. And this is a belter! Comfortable to wear. Battery like pretty good. Obviously depends on what you use it for. 4Gb storage, but not figured how to load music on it yet. A good balance between function and size. A nice watch. It functions well and has reasonable battery life. In watch only mode it lasts days. A little big for small wrists but reassuringly weighty giving a quality feel. Overall a good balance between function and size. I got a great deal on this watch. I certainly don't think it's worth it's original >£300 RRP, but at the recent sub £180 price I think it's a great deal. The watch looks great, it's responsive (some reviews say that it's slow to launch apps but I've not noticed anything that bothered me. On board GPS works well for running without needing a phone. Making calls via the watch is surprisingly good - very clear audio. I replaced the strap with a metal one, and got a screen protector for it. Really finishes off the look (although the standard strap is fine too). Love this watch. Loads of features. Smart and great price.